These toy soldiers from First Legion represent French and English longbowmen, knights and men-at-arms during the Battle of Agincourt; part of the Hundred Years' War. 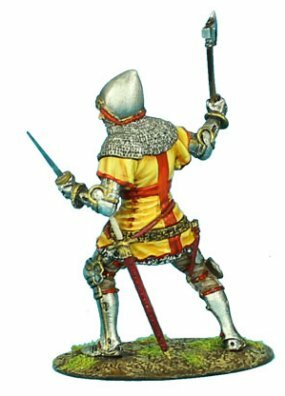 Agincourt was a definitive battle as the yeomanry of England, only lightly armored and armed mainly with the deceptively simple yew longbow drove back the flower of French chivalry. A combination of sharpened stakes in front of the English positions and the light armor on the French cavalry horses repulsed the initial charge. Later in the battle the French men-at-arms, in heavy plate, managed to reach the English lines but were so fatigued by the hundreds of arrow impacts and slogging through the muddy field that the English made short work of them. These figures are richly detailed and individually hand painted. Choose from historically accurate foot soldiers, armored knights, archers and mounted figures. 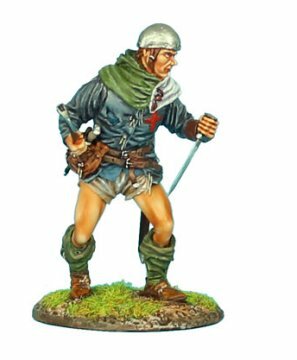 Browse First Legion's Medieval Wars metal toy soldiers below!